'Frostling' (Marky Smith, R. 2004). Seedling #97-10W. MDB, height 7.5" (19 cm). Late midseason bloom. 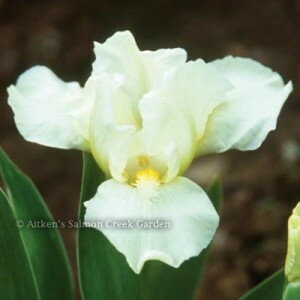 Cream white self (RHS 155A); beards white, tipped yellow, end white, throat strong orange yellow; slight ruffling; pronounced sweet fragrance. Sibling to 'Tahoma'. Aitken 2005.